Lakes are an integral part of our landscape, covering more than a million acres of our state! Maine lakes provide immensely valuable habitat for fish and wildlife, numerous recreational opportunities for people, and drinking water for nearly two-thirds of our population. Many communities are defined in large measure by their lakes. People relate to lakes in a way that is profoundly important to them and their families. Habitat and water quality of lakes are vital to both state and local economies. Lakes generate 3.5 billion dollars for Maine's economy annually, including 52,000 Maine jobs. 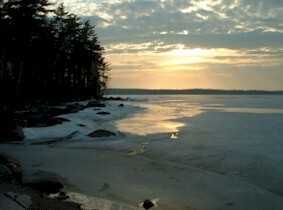 Tax revenues from shoreline properties are significant in many communities, thus deterioration of a lake can result in serious change to local economies. Restoration of a degraded lake is extremely expensive and is never as effective as protection. Invasive species are the most recently identified threat to Maine lakes and can alter human and wildlife use of a lake permanently. Maine statutory water quality goals include that all of our lakes be free of nuisance algal blooms, and have stable or improving water and habitat quality. Maine DEP (along with LUPC in unorganized territories) is charged with protecting Maine lakes and regulating certain human activities that affect habitat and water quality. Because rainwater falling on nearly half of the land in Maine passes through our lakes, most of these regulations pertain to how land is used. Additional information about lakes and invasive species can be found through the links below and on Site Law, Stormwater, NRPA and Invasives pages. Questions/ Topics Information for Lake Users, boaters, and camp owners. Aquatic phenomenon and water level management information. LakeSmart. Watershed management for homeowners. Phosphorus-free fertilizer. Why use it and where to find it. School resources. Lesson plans and information for schools and community groups . Watershed planning. Information from the Division of Environmental Assessment. Training Center. Page includes the the erosion control contractor list, information on the Front Runner program, and more. Regulatory Programs, Shoreland Zoning. etc. Also, see 38 MRSA 419, which bans cleaning agents containing phosphates, and restricts the sale of phosphorus containing fertlizers. For more information, see Lawns Green, Waters Clean.